I think before it's all said and done, I have to ride the Orient Express, because I love travelling by train and I love Agatha Christie!! There is something about going down to the station, with it's spectacular glass ceiling, imposing iron girders, and maze of intersecting tracks that says, "awe." From our apartment, we took the light rail train - a combination of streetcar and bus to Amsterdam's central station. Here we merged with the crowds and followed the signs in both Dutch and English, to purchase tickets to Utrecht. As Gouda is quite small, there is not a direct train to it from Amsterdam. However, trains from Utrecht and a few other centres, go to Gouda every fifteen minutes - totally amazing!! We were planning on visiting Utrecht, anyway. It's one of those "must see" places and we were not disappointed. 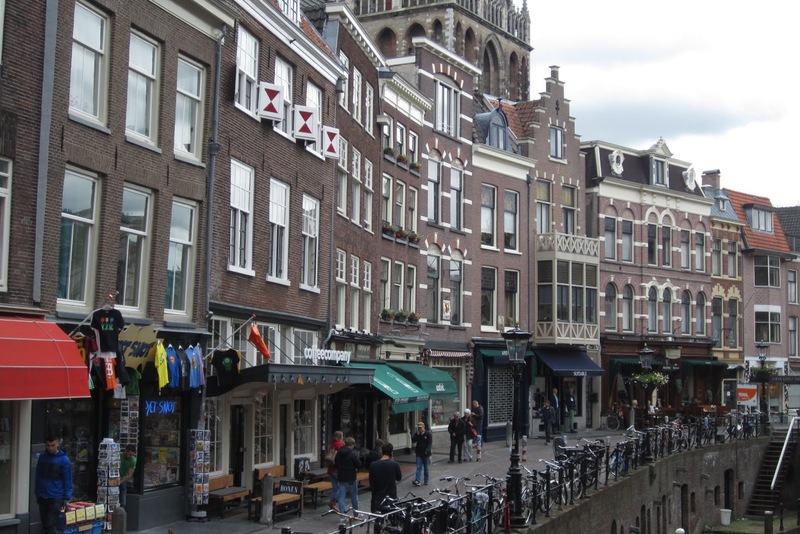 It's a lovely old university town with ancient buildings, tierred canals, winding streets, delightful shops and charming cafes. We arrived just before lunch. I do love planning itineraries around meals. 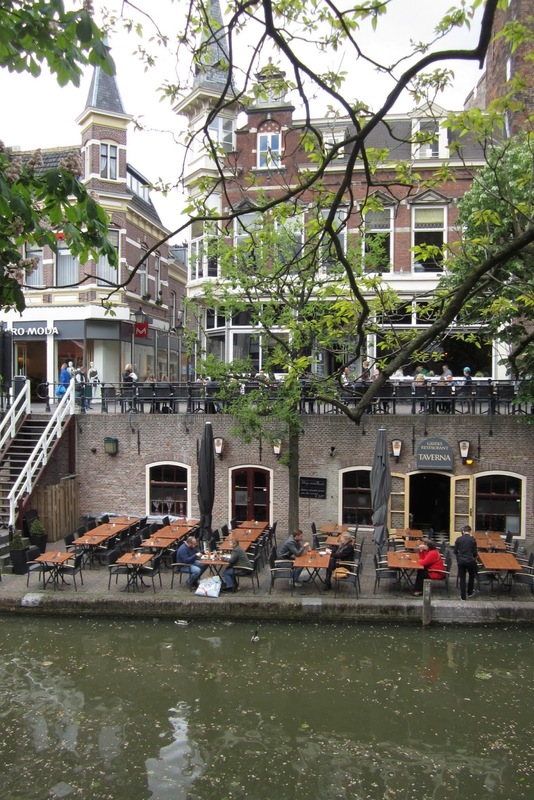 Even if we had arrived earlier - Utrecht is less than an hour from Amsterdam by train - there is always the tradition of having a coffee anywhere, anytime, isn't there! We left our bags in a locker at the station and wandered into the town for lunch. To our amazement, we realized that the Tour de France starts in Utrecht this year. I think that this iconic race will soon be renamed Le Tour d' Europe. 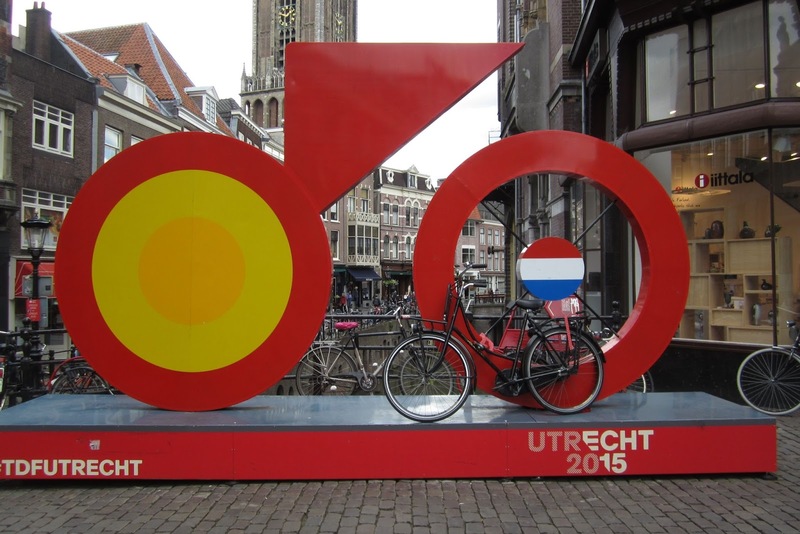 Since our daughter is a biking enthusiast and feels that Lance Armstrong has done and can do, no wrong, we bought her gift here - a T-shirt announcing that Utrecht will have its day of cycling glory soon. Although rain threatened, it never really poured and even though it was cool, many people were sitting outside for lunch. 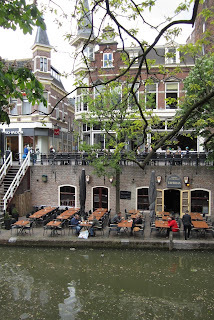 Of course, we sat outside for a glass of wine, an open-faced, melted cheese sandwich with walnuts on traditional dark bread, and a great cup of coffee! 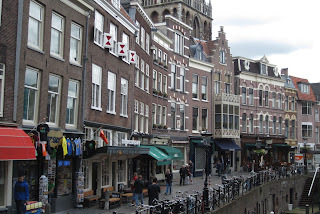 It was fun to wander, often getting lost, in the narrow streets that fringed the canals. I could have stayed longer, but we were booked into a small inn in Gouda for three days of biking and we wanted to get there, just in case it did rain. More later - have a great day! !